Dice aren’t meant to touch tables or the carpet you walk on with your bare feet! 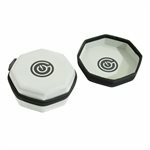 They are meant to touch velvet; Velvet that’s included in GeekOn dice trays. 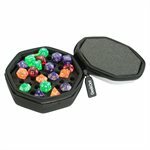 This dice case holds up to 30 dice, featuring waffle foam to protect your dice! Fits inside the GeekOn backpack. Detachable Velvet lined dice tray designed to keep the dice from touching game pieces. Available in 2 colors (Grey/Black, Red/Black) That’s a 50% chance of choosing the right color. Holds more dice than you need.